I hope you all had a great Labor Day weekend! Mine turned out to be pretty amazing! I had big plans for the weekend so I took Friday off work, leaving LA Thursday night to drive to Yosemite. My friends and I arrived about 11pm, got a few hours of sleep, then were up again at 3am to double check our gear and begin the 6 mile approach to Half Dome, where we planned to climb Snake Dike! I was so excited! Not only was this my first trip to The Valley, but I have been wanting to do this route ever since I began climbing a few years ago. We hiked in the dark for about three hours before the sun began to rise, giving me my first ever views of Yosemite and Half Dome. I have to say, I was not disappointed! Everything in The Valley is so stunning and immense, even standing beneath these monuments, it’s hard to believe they’re real! Even harder to believe that soon I might be standing on top! 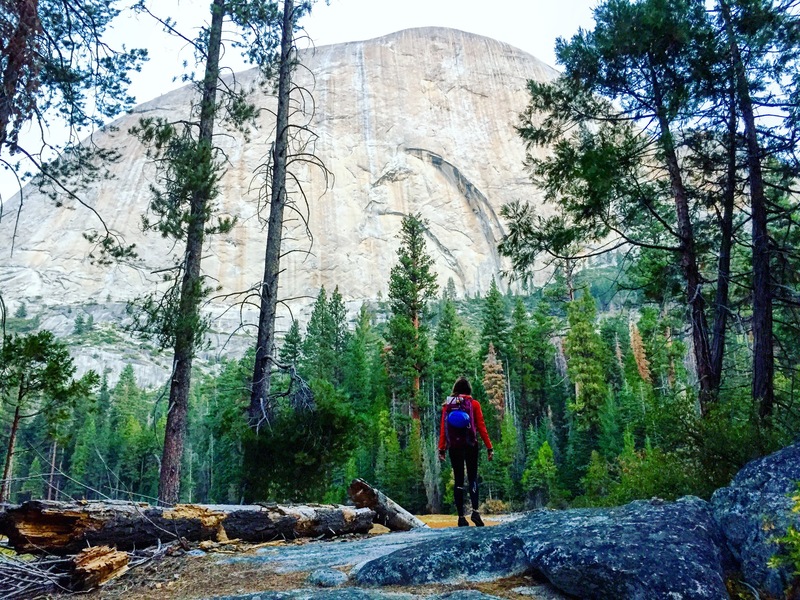 We hiked for another hour, scrambling up the lower south west side of Half Dome to the base of our route. Our early morning hike was a good decision and we were the first group to arrive at the route by at least an hour, which was great as a late cancellation meant we would be climbing as a trio. As the least experienced trad climber of the group, I agreed to play middleman while the others swapped leads. To be honest, I was a little disappointed about this at first, as I wasn’t sure it would feel like a legitimate climb if I didn’t lead the route. But for the sake of speed and avoiding traffic jams en route, it was pretty necessary, and as we started climbing, I realized that it wasn’t taking away from my climb at all! Snake Dike would only be my third ever multipitch route, and this was a great opportunity to practice rope management, belaying from above/below and getting comfortable with hanging on gear at height. That combined with the slab, general exposure, and long runouts put me completely out of my element! Even in the middle I struggled with fear and hesitation, and I certainly learned a lot about myself as a climber along the way. A thousand feet up is a great perspective for seeing what skills, both physically and mentally, you need to work on! For me, this consists of practicing slab, trusting in my climbing abilities, and not allowing myself to hesitate, but rather staying focused and trying to find a rhythm when I climb. Sometimes things don’t go as originally planned, but I feel that as long as you are learning something and pushing yourself, a climb is always worthwhile. So even though I’d like to go back and lead this route someday, in the end I wasn’t disappointed in the slightest. 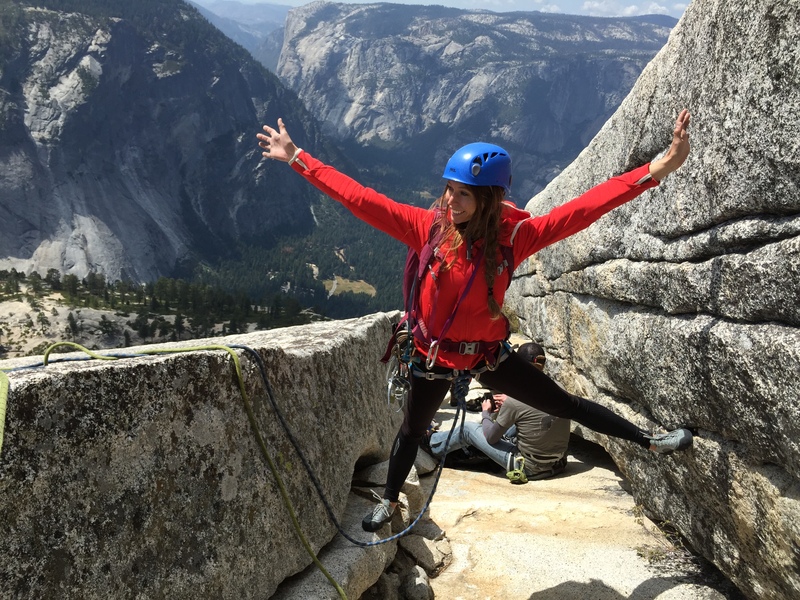 It was an amazing moment when we all unroped and continued up the easier slabs to the top, arriving to a welcoming committee of stunned hikers who had ascended the cable route! 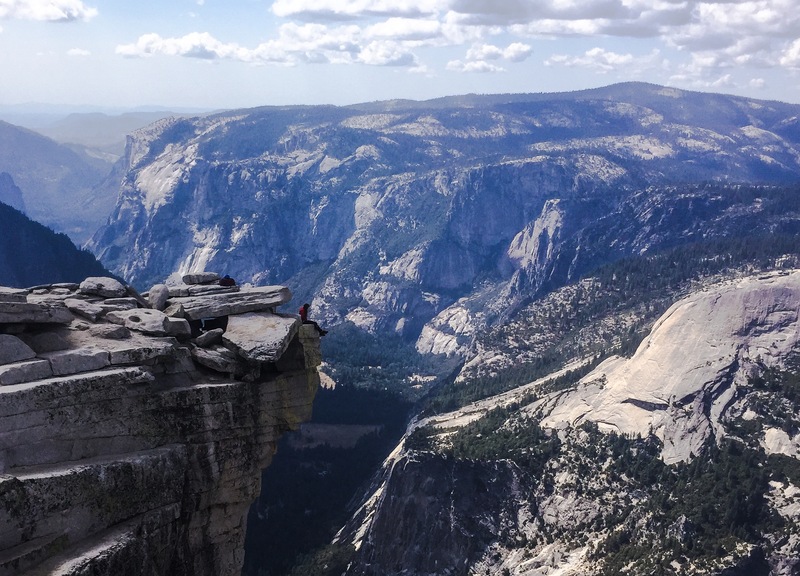 This last image, sitting with my feet hanging over the edge of Half Dome, staring down the face of something so vast and beautiful, was such a dream moment for me! We are so incredibly small, yet capable of some pretty incredible things.